HABIT: Open spreading growth in summer. Yellow flowers in spiked clusters. Large compound leaves. Gets large in one season. Native to the tropics. CULTURE: Needs sun, loose organic soil and moderate water and fertilization. Prune back after flowering. 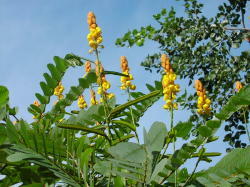 USES: Dramatic accent plant, late summer color, background and annual color for large open areas. PROBLEMS: Too large for small residential gardens. NOTES: Parks departments use together with cannas for a carefree colorful show.